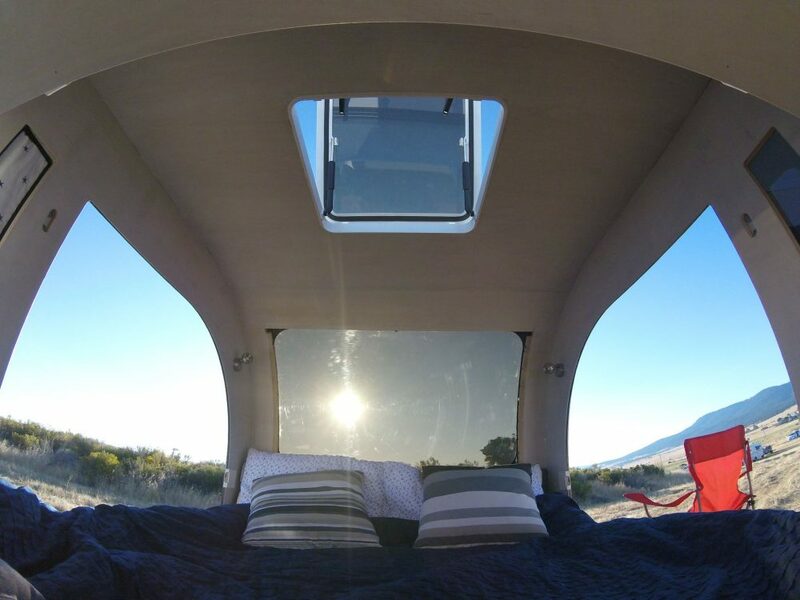 These teardrop trailers have better natural lighting by day and amazing views of the starry sky at night. 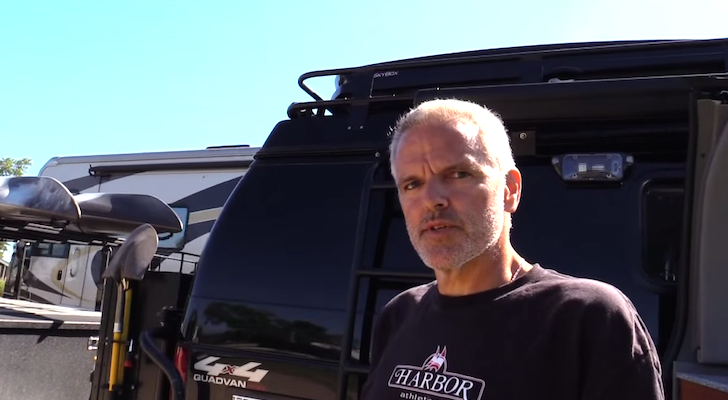 Many people are realizing they don’t need half the things they own and are downsizing to small RVs like teardrop trailers. 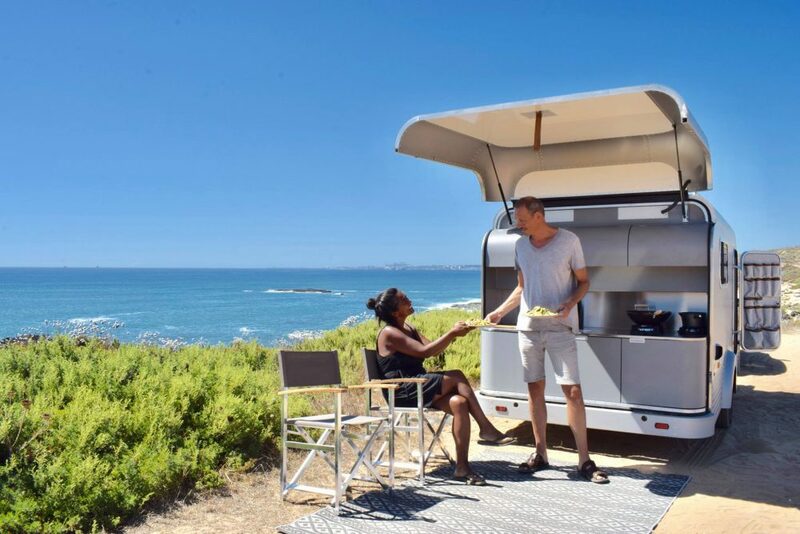 These campers are light to tow and they can fit in more campsites that aren’t suitable for the bigger Class A motor coaches. 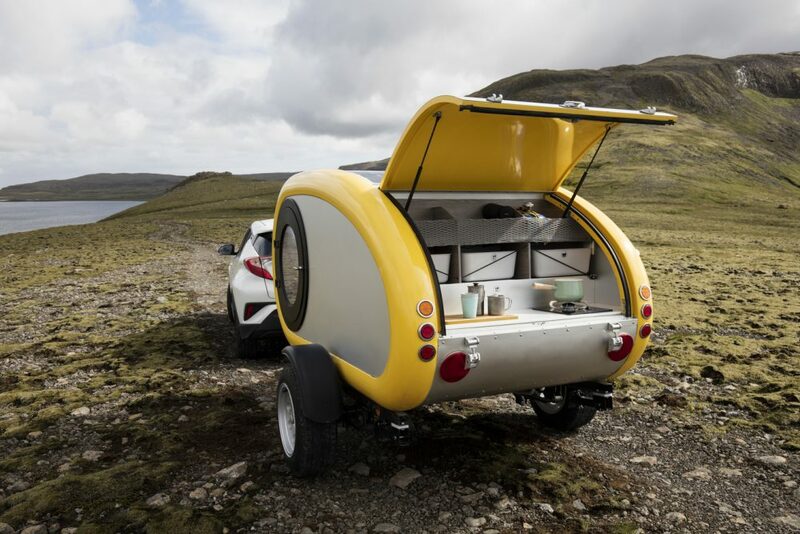 Despite their small size, teardrop trailers can be very comfortable. 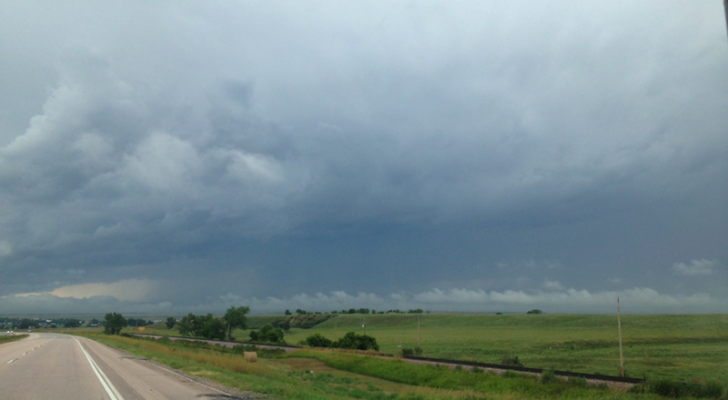 Windows help provide a good air flow and they keep the interior from feeling too cramped. 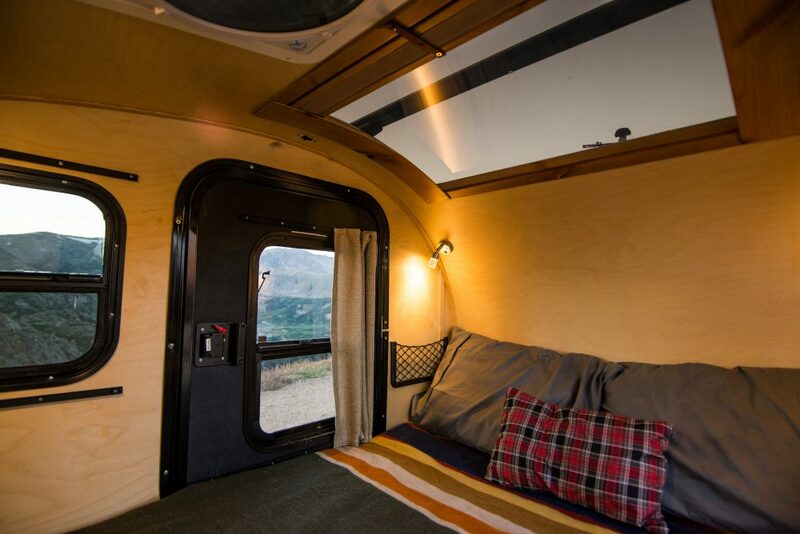 These five unique trailers also have skylights and roof openings, so you can have better natural lighting and fall asleep under the stars. 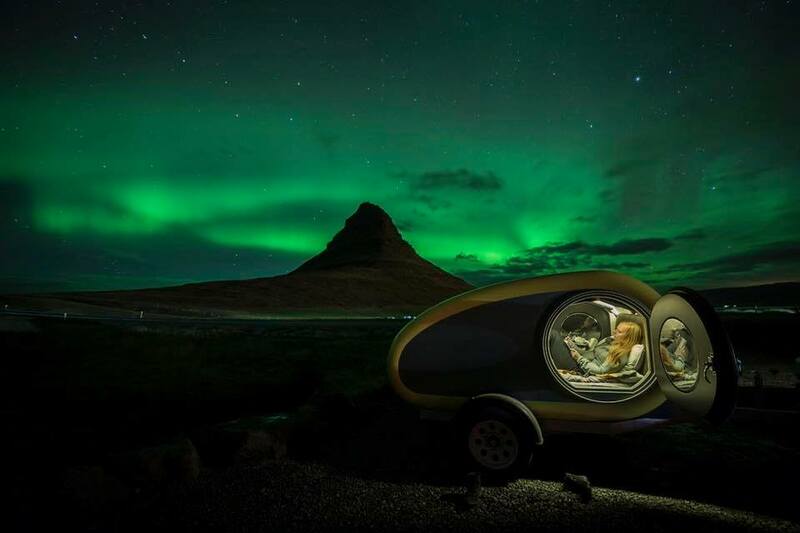 Mink Campers rents out these fully-equipped trailers for road trips in Iceland. 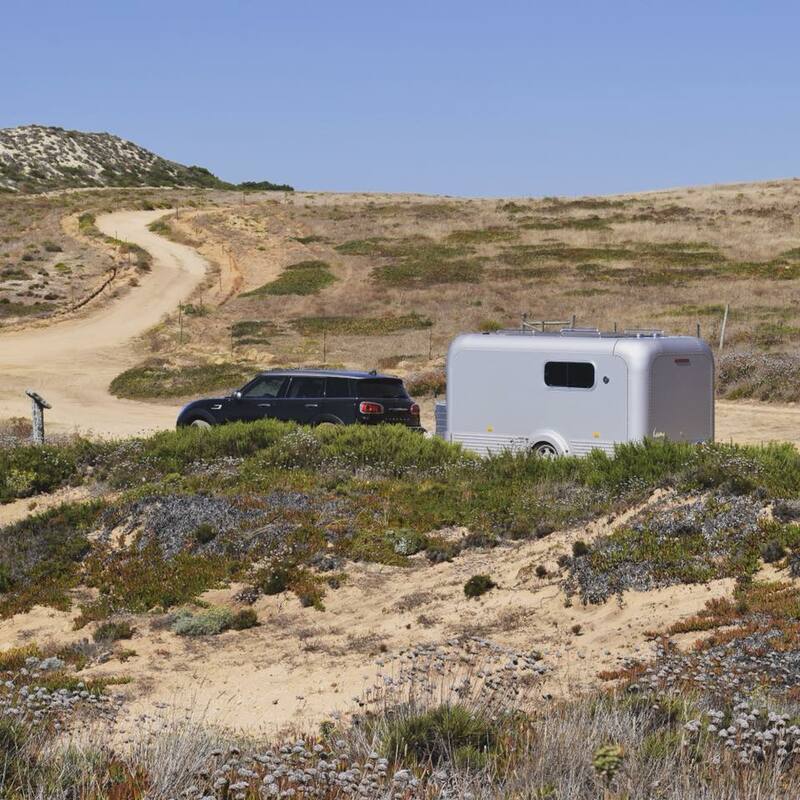 The light nordic campers can be towed by a 4×4 2017 Dacia Duster SUV, which are also available to rent. The camper’s galley comes stocked with utensils, cookware, a gas stove, and an ice chest. They also include chairs and a table for dining. 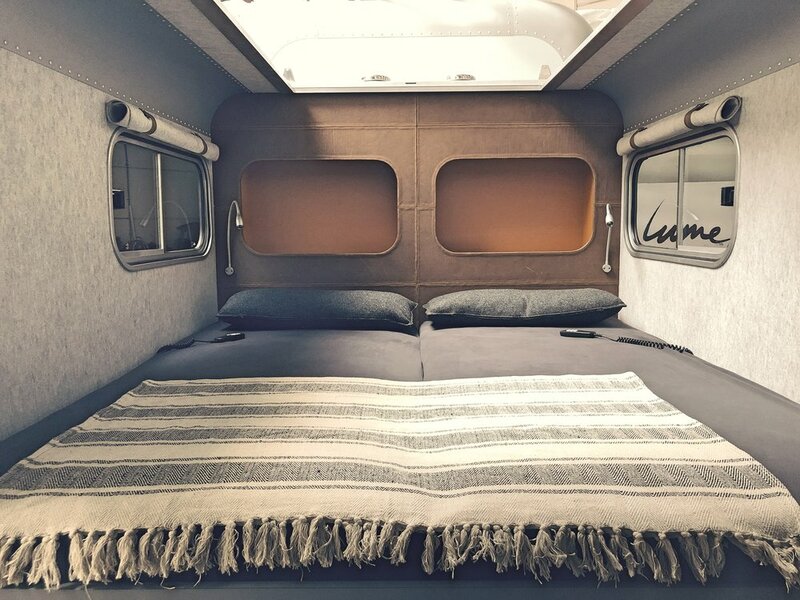 These tiny campers are built around a queen-size mattress fitted with Scandinavian linens, a duvet, and pillows. 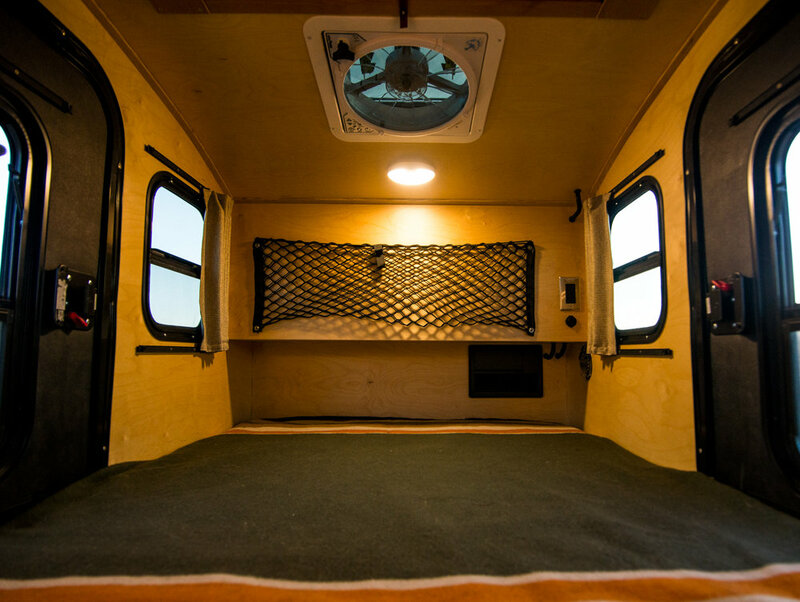 The interior features LED lighting, a sound system, and USB ports. 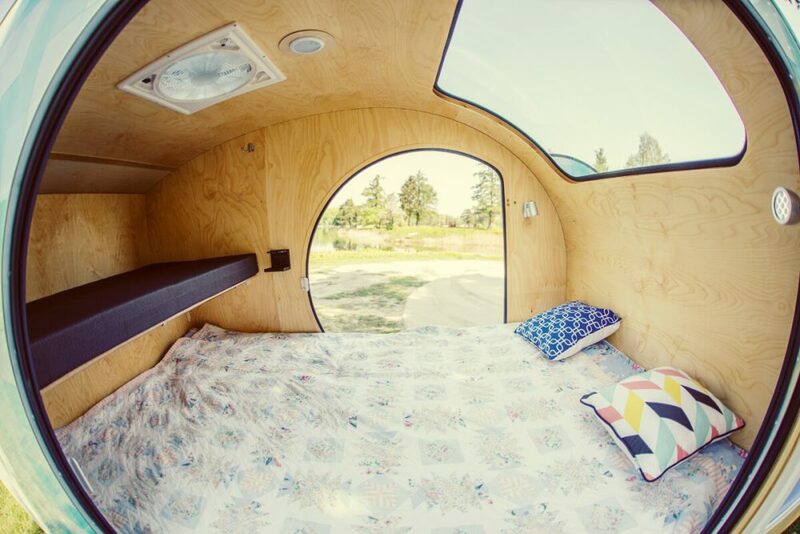 The trailers have a skylight and large side windows that give you a perfect view of the night sky and Northern Lights. The interior cabin is kept warm with a Webasto heater and thermostat. Mink Campers rents the teardrop trailers and SUVs for €269/day (currently about $312 in USD). You can learn more on their website, MinkCampers.is. 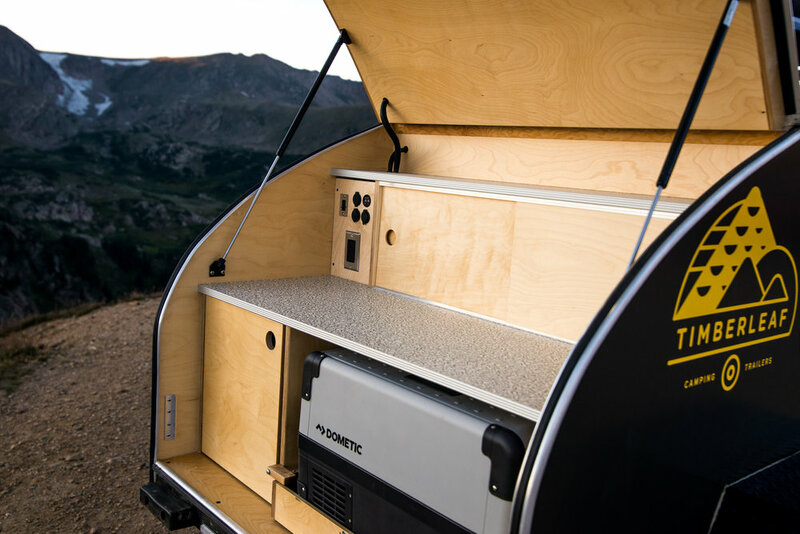 The Pika is the newest trailer from Colorado-based Timberleaf Trailers. 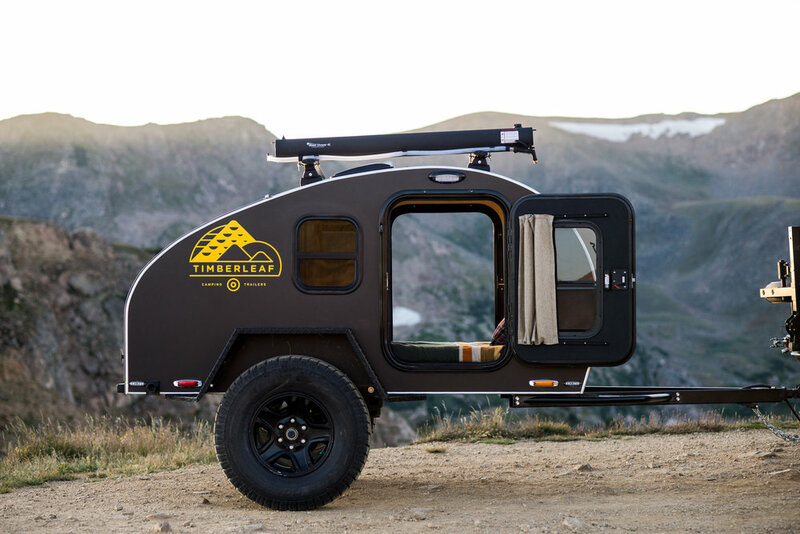 This mini camper gets its name from a small rabbit-like animal that lives in the high-alpine terrain in the Rocky Mountains. The new Pika trailer is 36% smaller than their Classic model. It is built with a 54-inch by 96-inch frame and the base model only weighs about 1,025 lbs. The camper is lightweight enough to be easily towed by most passenger vehicles. 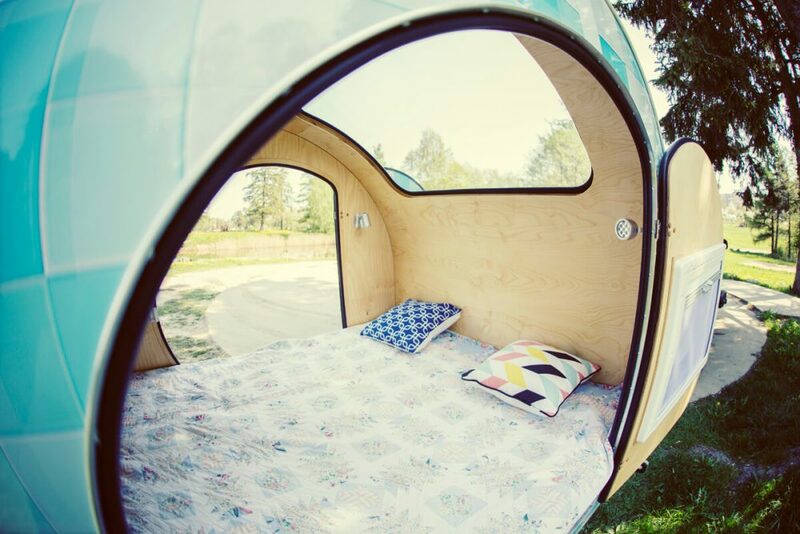 The Pika’s double-size mattress comfortably sleeps one or two people. The cabin is nice and bright between three LED lamps, two reading lamps above the head of the bed, and a dome light at the foot of the bed. There is stretch-netting cargo storage at the foot of the bed and on the side of the mattress by the doors. USB ports are also installed at the foot of the bed for charging electronics. The trailers are designed with a large overhead skylight, two sliding windows, and sliding windows on the two doors. They also have two Maxxair fan options for ventilation. The rear galley includes a large 21″x54″ main countertop and 10″ deep upper countertop. They feature USB ports, a 12V accessory port, and dual overhead dome lights. It comes equipped with a large, slide-out Dometic 12V refrigerator that can hold up to 35 liters of food and drinks. The lower compartment can be used as extra storage space and houses the 100-amp-hour deep cycle battery. The Pika can be upgraded to go off-roading with larger wheels, a 4″ lift, and electric drum brakes. You can learn more about the trailer on their website TimberleafTrailers.com. 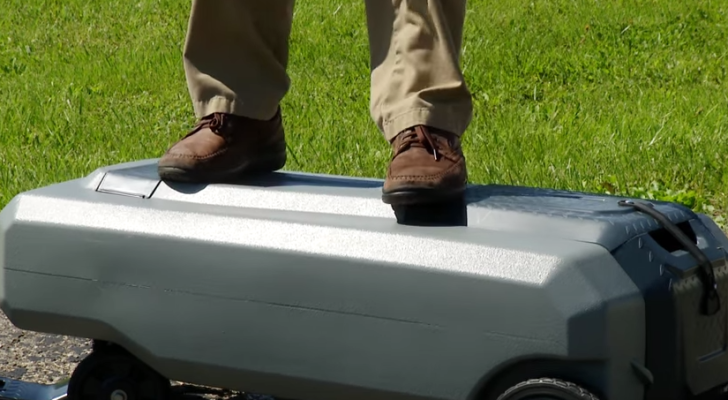 The Droplet Trailer only weighs about 950 lbs and can be towed by most medium-size cars. 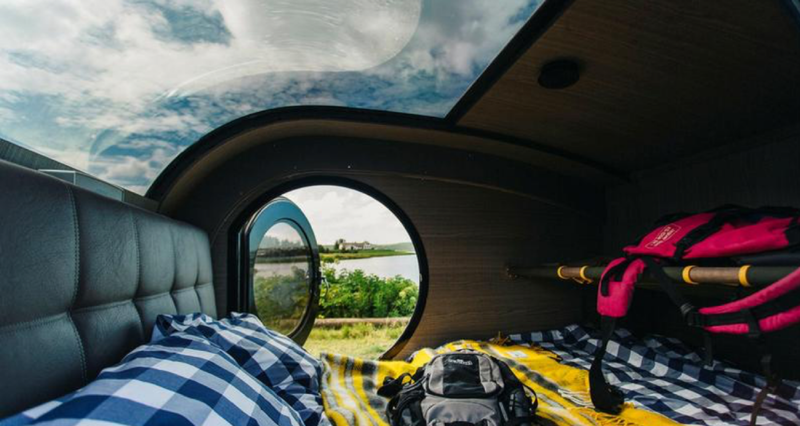 Inspired by boat and aircraft design, this modern insulated camper has a half-dome front window and a pop-up yachting hatch on the roof for ventilation. The insulated cabin includes a queen-size bed, two cabinets, and two shelves at the foot of the bed. There are also felt pockets at the sides of the bed for nighttime items. The galley’s countertop and backsplash are constructed of an acrylic material that is easy to clean. Dishes can be hung up and easily accessed on the backsplash and food/kitchenware can be stored in the wide pull-out drawer. The cooking space also includes a recessed sink, a 12V slide-out fridge, and a 2-burner propane stove. The space is illuminated by two flush LED lights that can be turned on by tapping them. 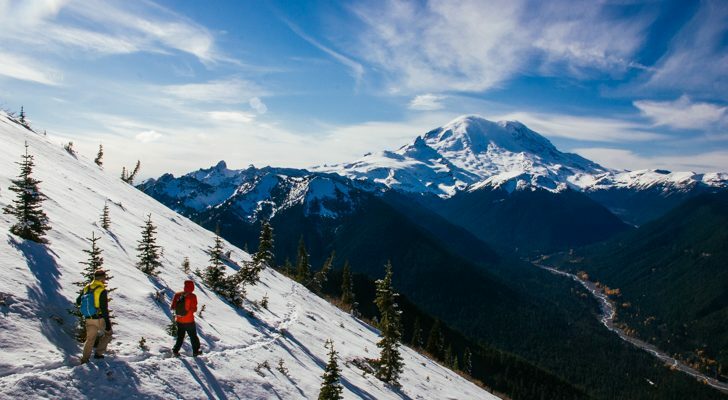 Droplet is based in Vancouver, Canada and has a variety of packages available. 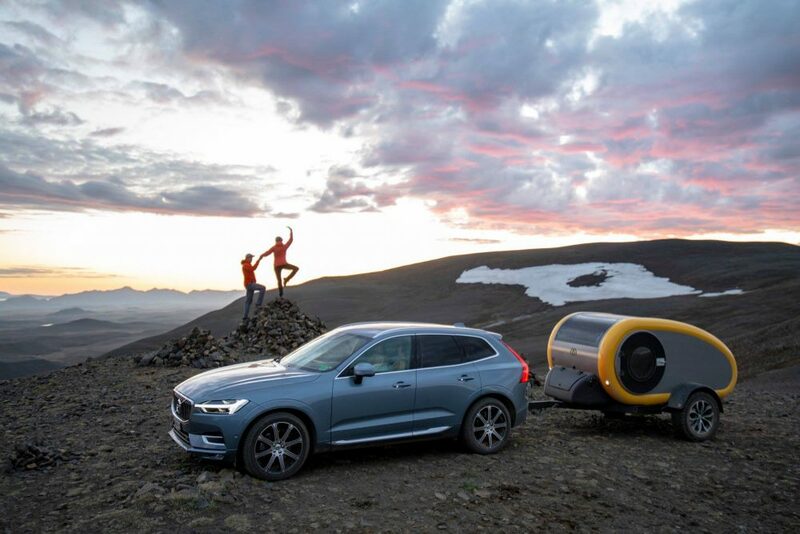 These trailers can be purchased or rented, ranging from their Base Package to an Off-The-Grid Package, and a Naked Package where you can install your own mattress and equipment. You can learn more on their website Droplet-Trailer.com. Technically, the Lume Traveler is not a teardrop, but this aluminum Dutch-made beauty is still lightweight, compact, and has a rear galley much like a teardrop design. 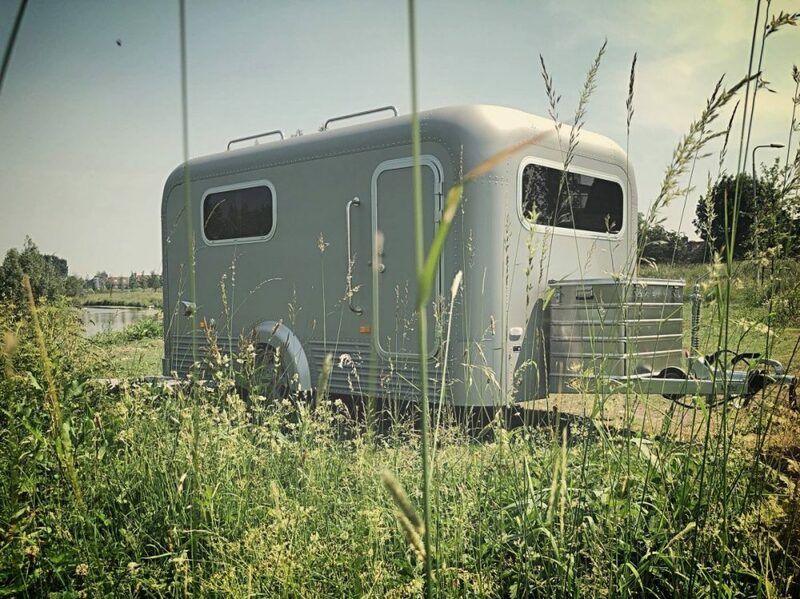 This minimalistic trailer is available in three options: the No. 1, the Basic, and the Shell. The No. 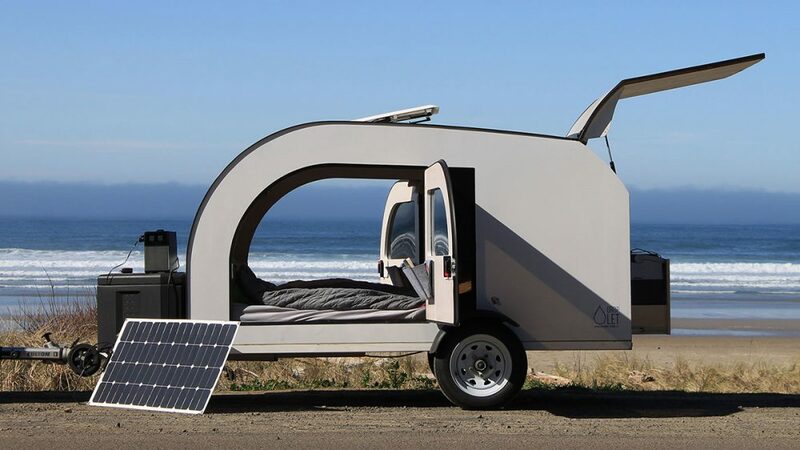 1 trailer has an open convertible fabric roof, plus a built-in insect screen to keep bugs out. Both of the side windows also have roll-up curtains for privacy. The interior is built with sustainable materials like teak and wool felt upholstery. You can also upgrade to include oak or linoleum flooring, as well as mobile WiFi and a 32″ flatscreen television. 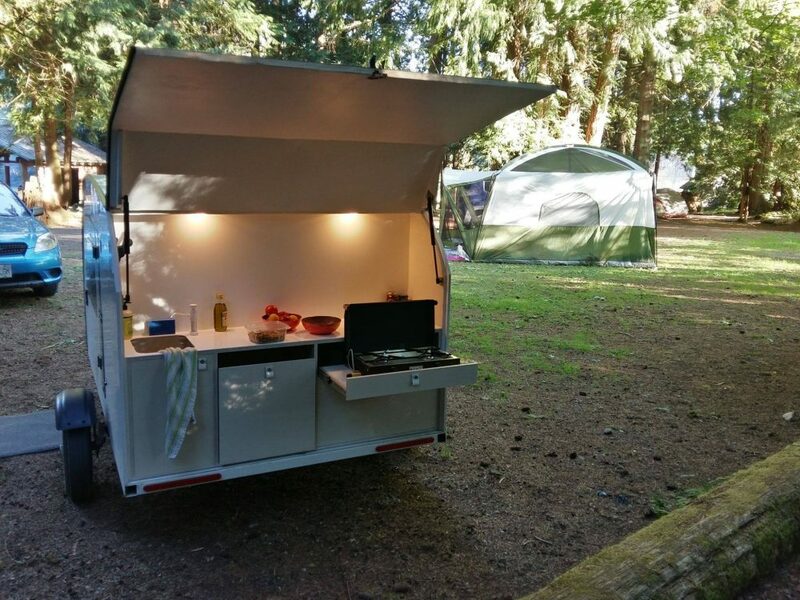 The Lume’s rear kitchen is much larger than most teardrop trailers. It features three upper cabinets for plates and glassware, and two larger lower cabinets to store food. 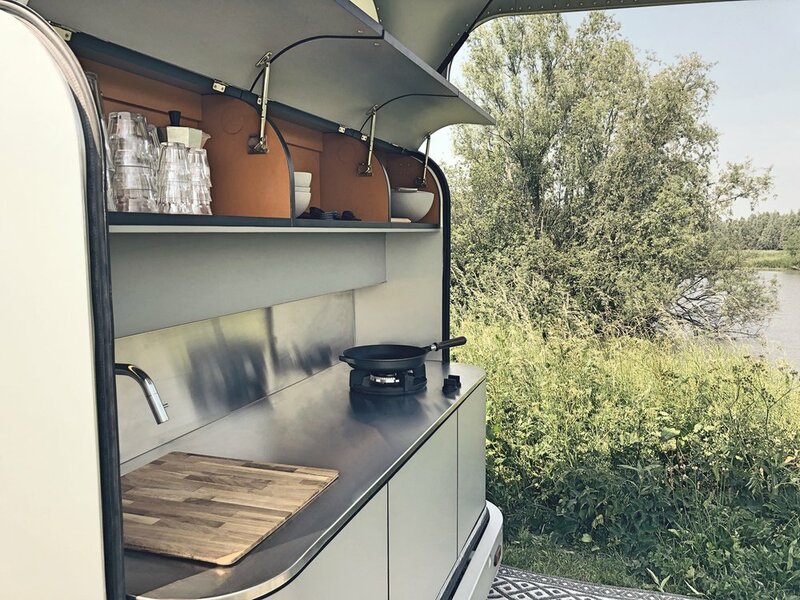 The cooking space includes two gas burners, a 40-liter fridge, and a gas connection for a barbecue. Without any upgrades, the No. 1 model is currently priced at € 46.500, or about $54,091 USD. The Basic option is a bit cheaper (€ 39.950 or about $46,471 USD) and has fewer features, however, you can add them in at additional costs. Their least expensive option (€ 27.250, about $31,698 in USD) is the empty Shell. This is the way to go if you like the strong outer aluminum shell but would rather build out the interior yourself. 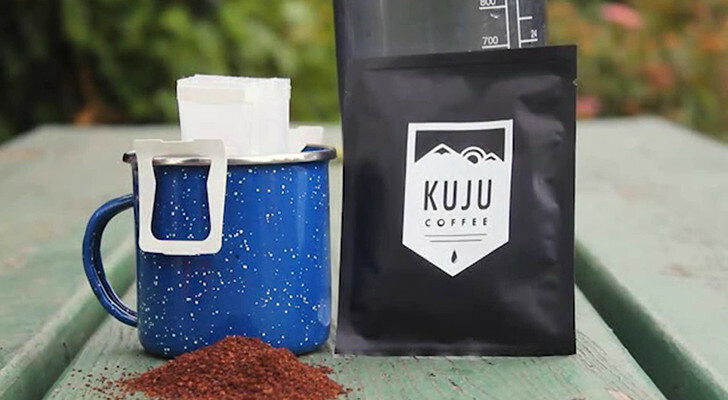 The company, Lume Traveler, is based out of the Netherlands. 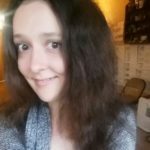 You can learn more about their trailers on their website, LumeTraveler.com. 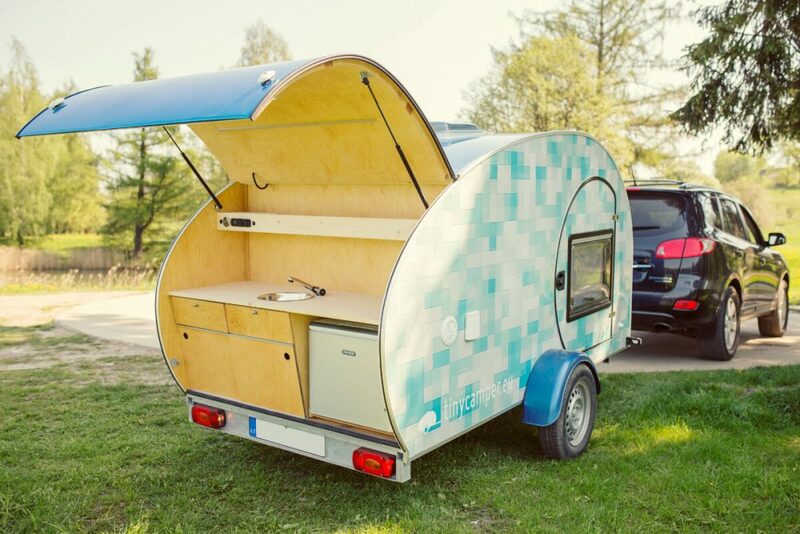 The Tearcuby is a lightweight camping pod from Europe-based manufacturer Tinycamper.eu. These trailers are big enough to fit a family of four and have a queen-size bed plus a smaller bunk bed. There is lots of storage space for gear and clothes incorporated under the queen bed. On the roof, a panoramic window will give you great views of the starry night sky. The roof also features a vent to help regulate the air flow and temperature. 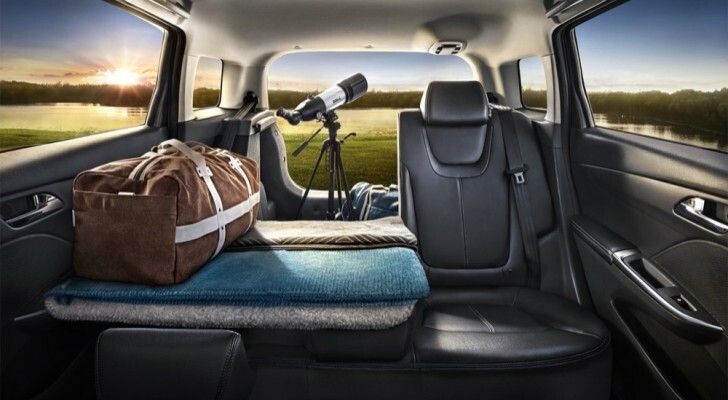 You can optionally add an entertainment system, a portable solar panel, and electrical interior heating. The kitchen is designed with a large countertop and lots of storage room to hold pots and pans. You can also upgrade to include a 3kg gas tank, fridge, and a sink. 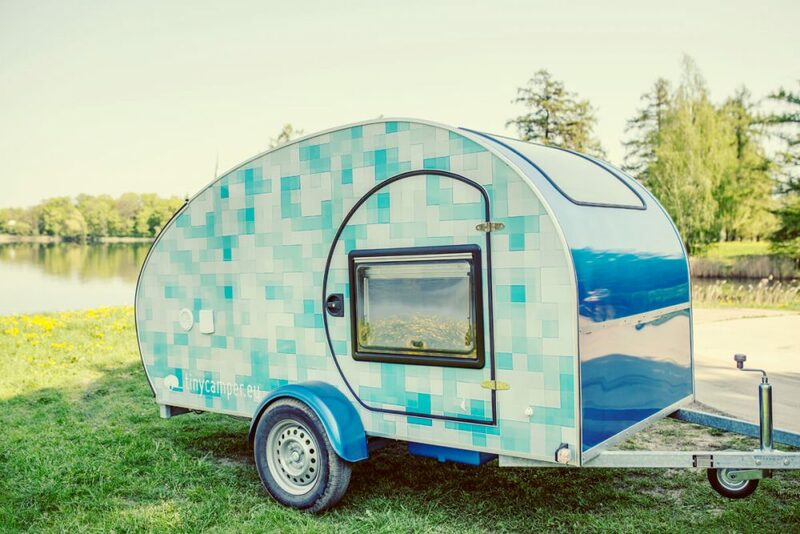 Tinycamper.eu also makes a Mini trailer and DIY kits that you can build out yourself. To learn more, visit their website. After a Lightning Storm, Always Check Your House Batteries. 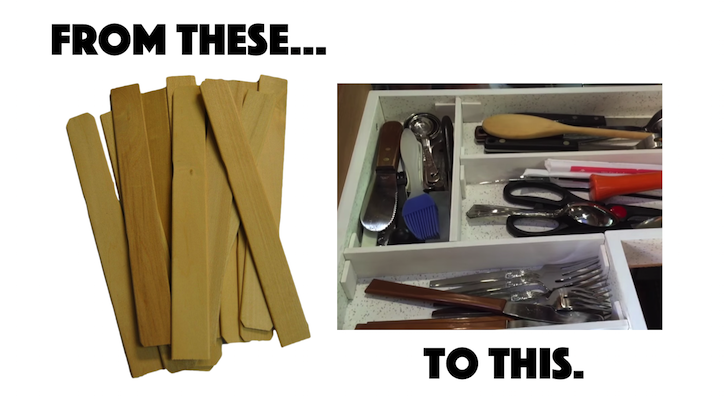 We Didn’t and Wasted Our Time.